Glass House #1103 is a stunning residence in Denver’s premier building. 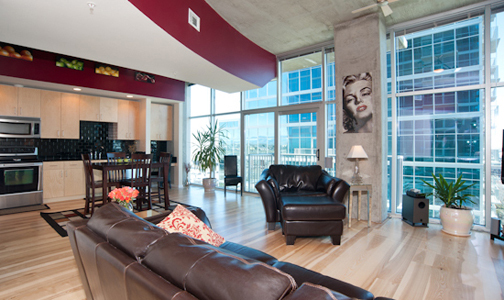 This spacious floor plan makes the perfect loft in the city. The modern kitchen includes maple cabinetry, stainless steel appliances and slab granite countertops. Beautiful wide-plank Ash floors throughout the home were added post-construction to give this home a unique feel. These floors can be refinished up to three times! An open living area provides abundant space for a dining room table along with an entertainment area. Floor to ceiling windows are complimented higher 11 foot! The alcove bedroom easily accommodates a king sized bed with side tables and has a walk-in closet. Beautiful views of downtown and Commons Park. This home is incredible! Offered at $330,000, call me to schedule a showing at (303) 618-3622.